US Army National Guard Spc. 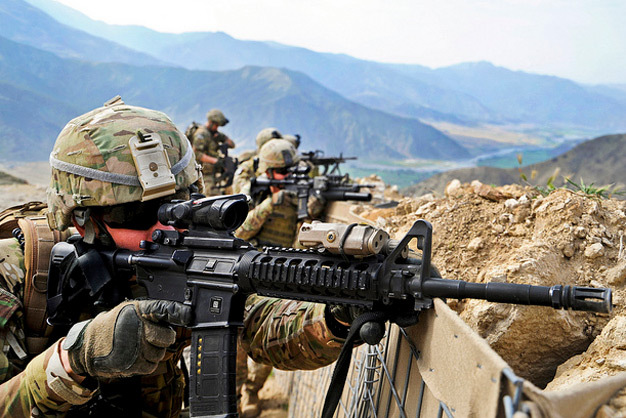 Timothy Shout, a native of Austin, Texas, scans the nearby ridgeline along with other members of the Provincial Reconstruction Team Kunar Security Force element, following an engagement with enemy forces. Shout is deployed from Alpha Company, 1st Battalion, 143rd Infantry (Airborne) out of Austin, Texas. The unit took small-arms fire from a nearby mountain top during a routine patrol, and was able to suppress the enemy with the assistance of local Afghan National Security Forces. Photo by the US Army.